The code we implemented to let people read the alt text on their phones is on all pages, regardless of whether they actually have an alt text or not. 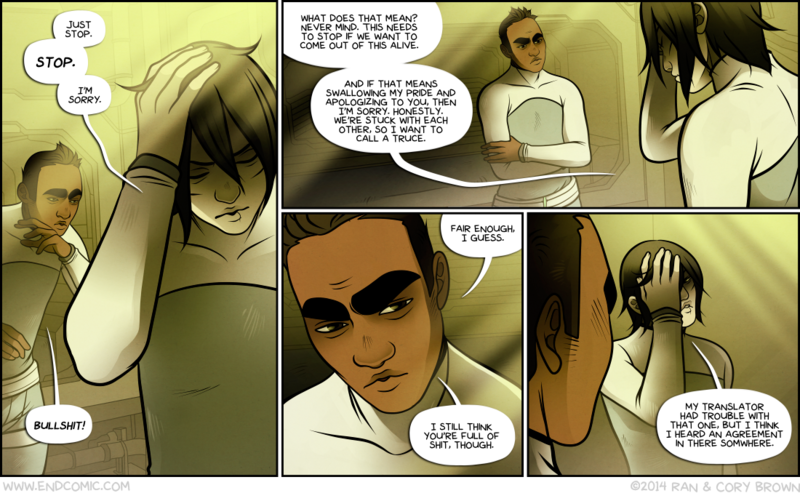 We decided to solve this by slowly going back, once chapter at a time, and inserting fun and terrible new alt text into old chapters. At first we weren’t sure how doable this would be, but if the creepy laughter from across the room where Cory’s desk is is any indication, it should be no problem. 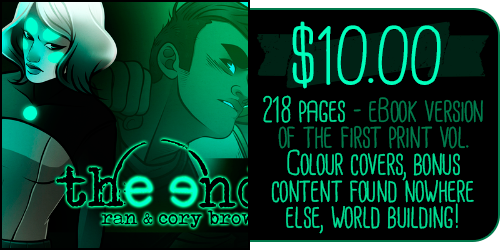 Cory has added an alt text for all thirty-eight pages of Chapter Twelve, which you can read if you so desire. It should only take a few weeks to do the whole archive, so if you want to read them but would like a front to back reading experience, you can wait and we’ll let you know when it’s all done. So, the other day I was feeling a little bummed about how we’ve never had a sale in it, but was secretly relieved because the biggest draw was the pre-order for our first book, which had a lot of delays (but will finally be at my house some time in the next couple weeks). I logged in, hid all the old products, stared sadly at the chart that said that we’d made $0 since the store was created and set about setting up some digital book products. I also accidentally deleted the site design (oops) and had to redo it. When that was all done, I noticed that I had a warning that I still needed to link my store up to paypal. I thought that was a bit weird because I distinctly remember that being the very first thing I did when I originally set it up. I relinked (two clicks, at least it was easy), closed my browser and started making some images that I could post in here with today’s update. And then I got an email. “Storenvy: you’ve made your first sale!” Huh, that’s weird. I guess someone clicked on the store right after I finished updating it and bought an ebook. Cool. And then, as if on cue, I got exactly TEN more ‘first sale’ emails from Storenvy, about one a minute over ten minutes. By the time the third one hit, I opened my dashboard and almost had a heart attack! 1) If you are one of the 10 people who pre-ordered books or artist edition books, those will be going out with the first round of kickstarter books! I am sorry for the wait! The first thing I added to the store was the eBook PDF for Volume One, the final print version. It has the first 10 chapters as well as Henri’s side story, bonus world building content on the Ith, the Makkuroa, the Hlurcht and the Fiah, diagrams and explanations for how shell, dodge and envelope technology work, and bios and design notes for Henri, Cassi, Jack and Trish. I’ve tested it out on both my iPhone and my Kindle, and it looks great on both! You can get it here or click the image. I also quickly threw together a pretty eBook PDF of the Files from our first intermission. It contains both the redacted AND the declassified versions of the files so that you can look at them side by side. The declassified versions contain the hidden text, a ton of Easter Eggs and subtle foreshadowing, notes from Sam, Max and his arch nemesis, Agent Jung and more. It also answers the question that many of you have been asking, which is ‘wait, if Victor is in space, what happened to his cat? 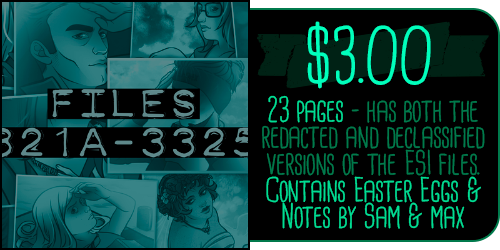 I am thinking about the possibilities and it is making me sad.” All together, this is 23 pages including the cover, and the declassified versions were, until yesterday, only available to patrons. You can get it here or, again, click on the image. Anyhow, that’s it for tonight’s ramble! See you all on Tuesday!